One of the most frequently asked questions about college applications is when to apply for college. I want to make sure this point sinks in. If you are starting college applications in the Fall of Senior year, you’re already behind. Without a strong college application checklist and time to plan and execute, you’re setting yourself up for a messy, stressful, and sub-optimal Senior year. If you’re asking when to apply for college and starting your college application senior year, you’re making the #1 mistake students make. The truth is, it is never too early to start thinking about college applications. When students and parents ask about when to apply for college, they are typically focused only on the moment of submitting the application. But in a way, your entire high school career is is one long college application. Being mindful and understanding the nuances around academic and extracurricular expectations is useful Freshman year of high school – it sets you up for taking more advanced classes to stretch yourself academically and paves the path for discovering and going deep in extracurriculars that will develop your talents and set you up for success come college time. That said, by Junior year, you should be actively preparing for and putting together your applications. The when to apply for college question stems from the misconception that college applications is a one time event you check off at a specified point during the year. However, college applications is NOT a singular event that’s relegated to senior year. It is a process, one that takes months of planning, preparation, and organization. Hopefully, you’re not a senior in high school yet (if you are, we still have some helpful tips for you later on). I want you to think about your current day-to-day. You’re likely spending a lot of time on your classes – honors, maybe AP or IB. You spend time on homework and projects from those classes. You’re studying for tests to keep your GPA up. You’re probably involved in school clubs, spending time planning meetings or running events. Maybe you’re an athlete, fitting in practices before and/or after school and traveling for meets or games. Perhaps you volunteer somewhere, dedicating 5-10 hours a week to your cause. You might play an instrument, spending time practicing alone, taking lessons, and performing with your band or orchestra. Your schedule sounds pretty jam packed already. That’s why you need to start earlier. Much earlier. Take the word of a fellow procrastinator. When it comes to college applications, procrastinating doesn’t work. All it does is compromise your senior year experience, your applications, and your chances of admission at your dream school. For example, let’s take one section of the college application process, the dreaded Essays. A common misconception we see from students is that you will only need to write 3-4 essays for all of your college applications. This could not be further from the truth. 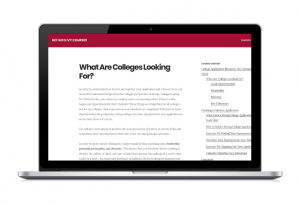 While platforms like Common App allow for personal statements that can be used for multiple schools, some colleges, especially selective colleges, also require school-specific supplemental essays. This means that to apply for 10 colleges, you may have to write 13-15 essays. Throw in 2-3 drafts per essay to proofread, edit, and finalize them, and you may suddenly find yourself writing upwards of 45 drafts during your college application process. If you’re not yet a Junior in high school, congratulations. You’re ahead of the game. It’s still helpful to get an early peak at a college application checklist to see what’s coming up. If you are a Junior, get started now. Get a college application checklist. Print it out. Discuss it with your family and support system. Tack it onto your fridge to keep you on track. And start cranking away at the month-to-month tasks. You’ll thank yourself Senior year. If you are a Senior, I will be frank – you are starting late. And that is the last time I want you to think about that. Get a college application checklist now – you need to get organized and see where you are behind. Do an inventory of every checklist milestone you’ve missed so far and build a plan for how you can make these up ASAP. Focus on standardized tests first. Testing schedules aren’t flexible. Finally, for those of you who are looking for a good college application checklist, we consulted our Ivy League college interviewer and application consultants to put together this Comprehensive College Application Checklist and Timeline. It includes a month by month breakdown of tasks and to-do’s and includes advice and insights from our experts on major milestones. If you have questions about the checklist or the college application process, leave a note in the comments.